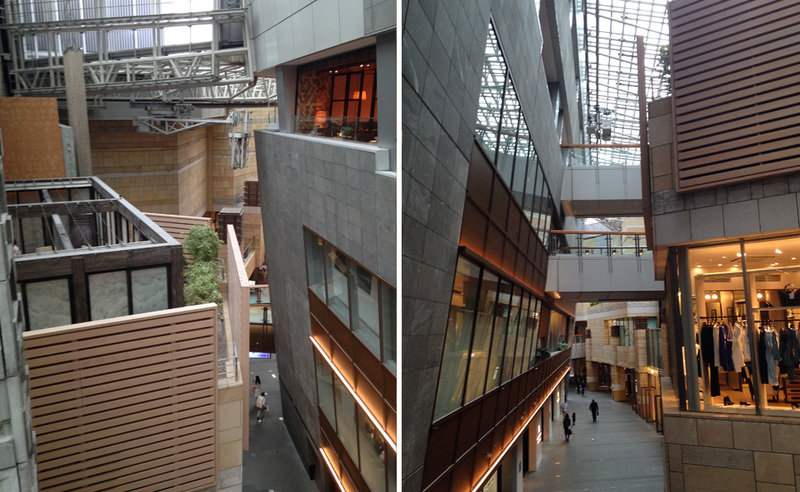 Malls are rarely the architectural highlights of a city, but the ones in Tokyo are an exception. 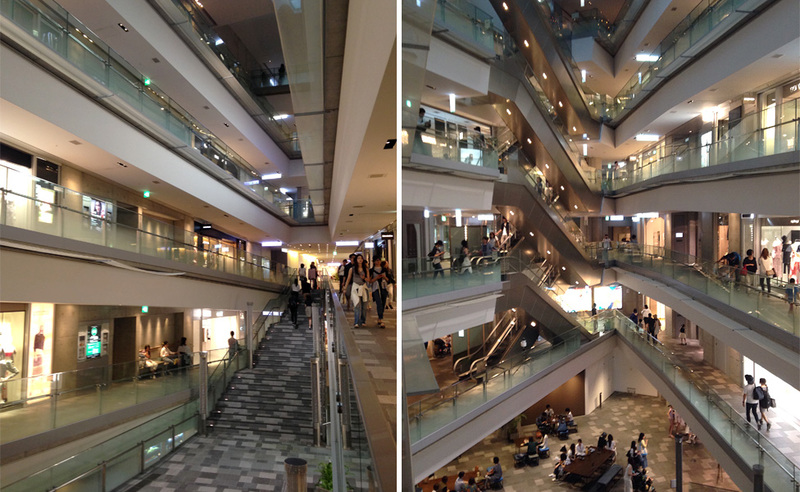 Most malls in Tokyo are relatively small and very well designed since they concern themselves more with the quality of the building rather than the size. 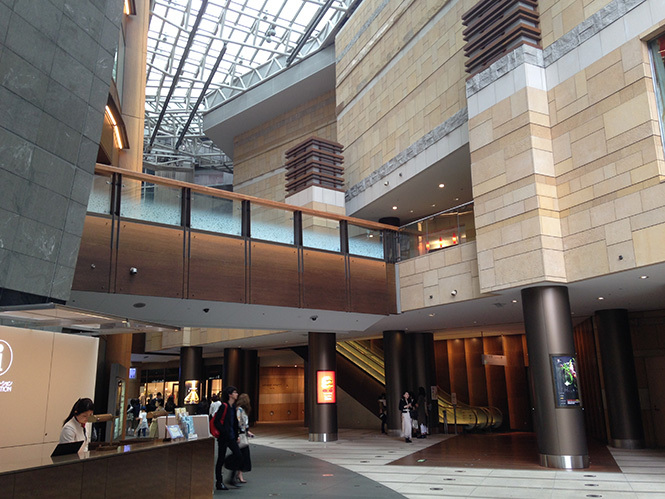 I visited three malls during my trip to Tokyo, all of which have their own distinct character and architectural style. Located in Jingumae Street in Shibuya, Gyre is a very small, 5-story luxury mall designed by Dutch architecture firm MVRDV. 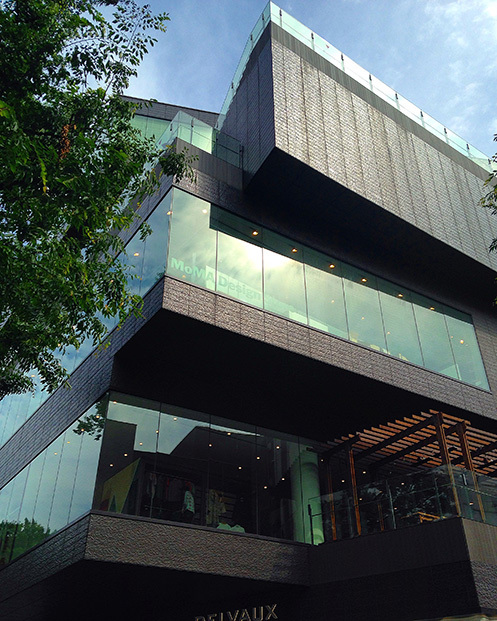 The highlight of the mall is its asymmetrical façade consisting of glass and black tiles. One of the principles of MVRDV’s design philosophy is sustainability, and this is evident in the building’s strategic circulation (through the use of the “hollows” on the exterior) and vertical structure. MVRDV decided to create a “vertical promenade” instead of the typical horizontal mall since those take up more land. Although it looks intimidating and quite shocking from the outside, it has a very simple layout inside, consisting only of a square hall and two escalators. I really loved this mall because it has a Maison Margiela store, a MoMA concept store, and the Comme des Garçons Trading Factory (a concept store of Rei Kawakubo). This sleek building is designed by Japanese architect Tadao Ando and is located on the same street as the Gyre building. It looks incredibly simple and incorporates the signature zen influences of Ando. It won’t really catch your eye from the outside, but once inside, you will notice the sterile appearance of the building. The building mainly uses white concrete making it look starkly minimalist. Look to the western end of the building and you will see the symmetrical, geometric effect the escalators make that breaks the consistency of the building’s linear pattern. There is also a giant tile staircase opposite the escalators that lead to the third floor. Valentino and Bottega Veneta are among the brands that have a store here. Roppongi Hills is designed by American architecture firm Kohn Pedersen Fox. It incorporates elements from Japanese minimalism, such as wood and grey tiles, and sustainable design, through the use of green spaces and a streamlined framework to aid in ventilation. I love the interior especially due to the building-like structures on the sides, which makes it seem as if you’re on a street when you’re walking along the ground floor. 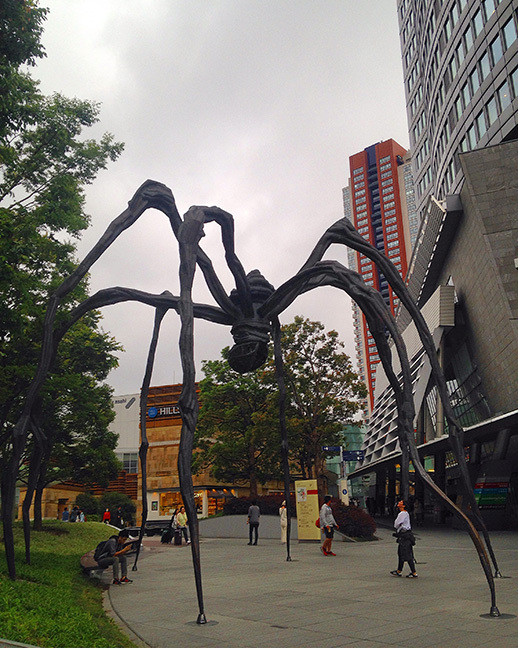 The mall also has a lot of outdoor spaces, art installations (the most famous one being Louise Bourgeois’ Maman), patches of greenery, and minimalist fountains. Roppongi Hills isn’t really a mall but a development project in Minato that consists of a mall, the Mori Art Museum, The Grand Hyatt, and office buildings among others. Several Michelin-star restaurants are also located here such as the one-star Jean-Georges and the two-star L’Atelier de Joël Robuchon (with the accompanying patisserie La Boutique connected to it).